You’ve sent a free gift to a subscriber in exchange for their email address. They’ll receive the gift in their inbox, open it, and begin consuming the information you’ve given them. What does your audience receive after the free gift? Do your leads need to search for someone to help them move forward because you aren’t letting them know how you can hep them? Growing a list of interested leads only has value if you communicate with them effectively. You understand that you need to connect and be of value, not just sell. So… you begin to write your email sequence… the sequence that will engage your audience, allow them to connect with you and trust your guidance, keep them interested and opening the next email, and the next… and get them ready and excited to click on your next offer. You sit down at your computer. You’re staring at a screen… waiting for the words to come. What will my audience like? What will build a relationship, but still be valuable to them? I can help provide you with the strategy, layout and finished product to create content that’s engaging, on brand, and consistent with what your audience is looking for. Are you looking for help with Email Marketing Funnels? I’ve designed process that will get your prospects opening your emails and anticipating the next offer you have coming down the pipeline. It’s a technique I developed that has resulted in up to 74% open rates within email sequences, while regularly still getting 35% or higher open rates in the 6th email of the series. These open rates are leaps and bounds over industry standard. This technique pulls the best, most effective pieces of the strategies created by some of the most successful copywriters and business professionals in marketing, and combines these techniques with the Story Pathway layout to get amazing results. This method uses your best features and personality to reign your audience in, build trust, keep them engaged, and pre-frame them for your offer. Or, would you like a knock-out Sales Page you’re proud to send your audience to, creating just the right look and feel for your business while arming your leads with all the information and they need to click the ‘buy now’ button? I’d love to see how I can help you to build a relationship with your future clients and grow your business, your revenue, and your dreams! 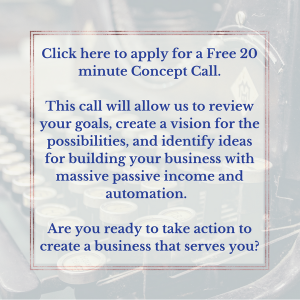 Click Here to apply for a free concept call to go over your goals, next steps, and what your business needs to push it over the top and be the obvious choice to your audience.